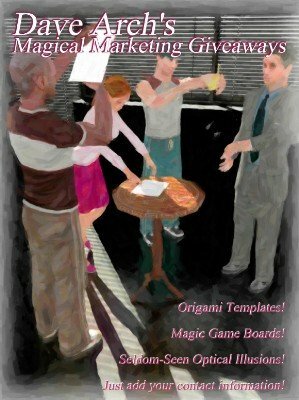 This ebook contains reproducible masters to use in marketing your magic or mentalism shows. The magic component of each piece ensures that the receiver keeps it and even shows others. You'll find simple origami templates with dotted fold lines (including the Hopping Frog introduced to the magic community by Michael Close); magic board games (some of which are designed so you can determine who wins and what they win); and seldom-seen optical illusions. Originally published as a book of magic tricks for making a trainer's handout more memorable, this collection now waits for you to add your contact information and use in your own marketing plan.